There's no reason why winter has to look barren or drab in the garden. Lots of succulents show their brightest pigments when days become shorter and temperatures start to drop. Succulents prepare for winter dormancy by reducing their chlorophyll content. As green chlorophyll recedes, the leaves can reveal vibrant pigments of red, blue, and yellow. All of our favorite winter interest succulents are frost tolerant down to at least -20F (hardiness zone 5) so gardeners in most climates can enjoy them outdoors all year long. 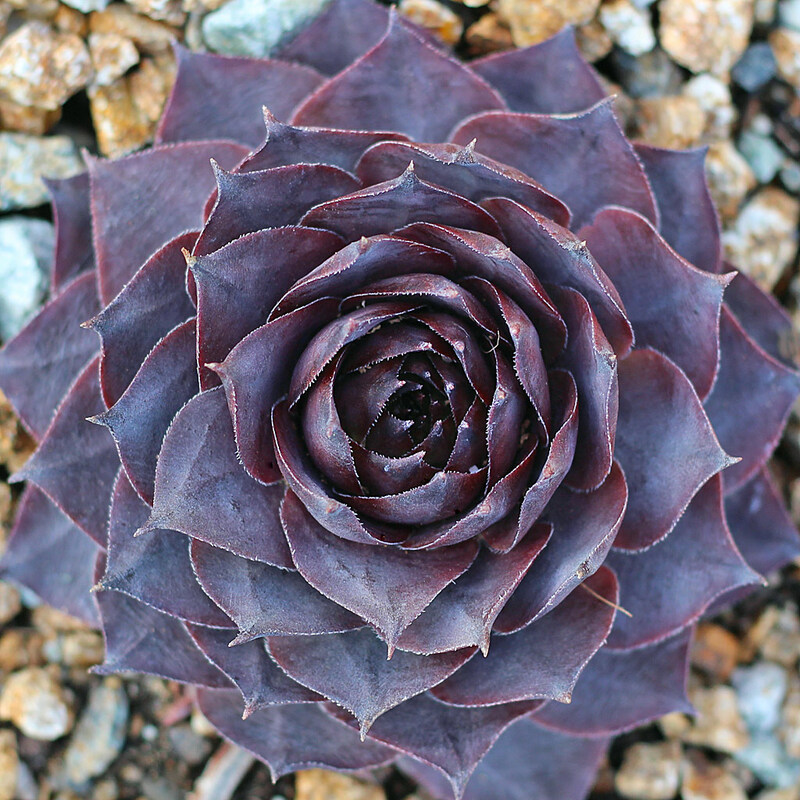 You'll find varieties below from the genera Sempervivum (Hens & Chicks), Sempervivum heuffelii, and Sedum (Stonecrop). 'Somerwise' spends most of the year a demure, pastel grey-green. Once winter hits, it completely transforms into a vibrant rosette of pinks and purples - just in time for Valentine's Day! Its leaves are outlined by a fine edge of white cilia that highlight their elegant form. 'Grammens' has a different look for every season with shades of maroon, blue-green, lavender, and copper. It really stands out from the crowd in the winter, when its purple leaves deepen to near-black. And here's the kicker: 'Grammens' is one of the extra large semp varieties; each rosette can reach over 8.0" in diameter. 'Stuffed Olive' is a rare cultivar not often seen in collections. It has vibrant red and green contrasting in warmer months, but looks entirely different in winter. Though it usually has green tips and a red heart, these colors reverse in the winter and the red tones deepen and soften. This is also a variety that tends to produce a lot of chicks, so you'll always have plenty of 'Stuffed Olives'. Sempervivum heuffelii 'Red Heuff from Munich University' may have a ridiculously long name, but it also boasts stunning colors through the seasons. For most of the year, you'll see it with a green center and fire engine red leaf tips. Come winter, however, the green recedes and the red leaves deepen to aubergine with a bright white outline of cilia. 'Perfection', true to its name, is a real treat to observe in the winter. While the pastel greens it displays in warm weather are lovely, nothing compares to its lavender and blue-green combination in winter. Blue is a rare tone to find in hardy succulents and it works particularly well in winter as a contrast to all of the deep burgundy seen in other outdoor succulents. 'Beacon Hill' is a warm, eye-catching purple all year long. This rosette is a great option if you want distinctive winter interest without major color changes from season to season. 'Beacon Hill' is predictably resilient and predictably gorgeous. 'Angelina' is a spectacular yellow accent year-round, but in winter its tones shift from lime to gold as the days shorten. 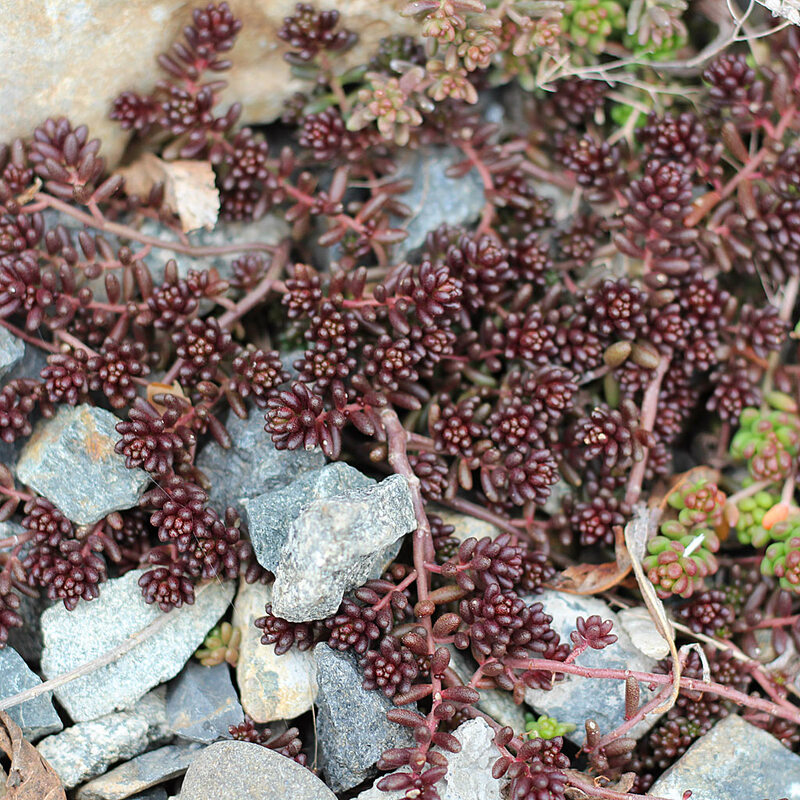 It makes a striking contrast against all the winter burgundies, like the reddish Sedum spurium seen above. 'Angelina' is a relatively fast-spreading ground cover and will quickly fill an open space with its cheerful colors. 'Blue Spruce' spends most of of the year, as its name suggests, in shades of blue. Come long winter nights and receding chlorophyll, flushes of pink become visible at the ends of its needle-like leaves. The gradient of peachy pinks and blue-green creates an overall lavender effect. 'Black Pearl' has tiny, delicate leaves but its color sure packs a punch. In the landscape, it makes the perfect ground cover, spreading quickly but not so aggressively that it shades out other plants. It's summertime mix of copper and lime is wonderfully verdant, but you'll really look forward to the lustrous, deep maroon it reveals in winter. There are so many more hardy succulent varieties that show off their best colors when the rest of the garden is bare. Don't know where to start? You can get the best sampling of easy-to-plant outdoor succulents in our Hardy Plug Trays. Our extensive FAQ has answers to everything you need to know about planting and cultivation. We also recommend Sempervivum: A Gardener's perspective on the Not-So-Humble Hens-and-Chicks by Kevin Vaughn for some marvelous insights into our favorite hardy varieties. Long live the colorful winter garden!